By following the movement of the ball, the child's eyes track left and right, developing a skill that is important for later reading and writing. 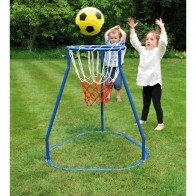 This activity gives the child practice with hand-eye co-ordination as the balls are put through the hole at the top. The ball then rolls back and forth down the slope and is then delivered to the base of the box ready to repeat the activity over and over. By following the movement of the ball the child tracks left and right developing a skill that is important for later reading and writing. Supplied with a wooden ball and an air flow ball so that the speed of the movement is different. This is an educational product not a toy and requires adult supervision.